Sometimes I tend to overlook some of the interesting things that happen closer to home for the sake of wanderlust. Fortunately there is no shortage of things to report about cows and culture in my home state of Colorado. Polly Reich, who I learned about through a friend, is the first female professional bull rider to compete against men and she lives only a few miles away from my home. She was kind enough to let me interview her about her career in bull riding when I called her out of the blue a couple of weeks ago. Polly started bull riding when she was 29 years old, an age that many bull riders have already hung up their chaps and rope. She was working as a dog groomer in Deerfield, Illinois and raising her twelve-year old daughter when friends took her to a rodeo to get her out of the house and her mind off of a break up with boyfriend of six years. Polly had never been to a rodeo before and was not excited by any of the events until the last event of the night – bull riding. Polly was captivated by the sport and left the rodeo thinking, “I could do that” a thought few others leave a rodeo thinking. Without telling her friends or family, including her daughter, Polly sought out a mentor to teach her how to ride bulls. One rodeo changed the course of Polly Reichs life and turned her into the modern day Annie Oakley you see pictured here. This photo is from a print add by one of her sponsors David James Fashion. Several people told her that Larry Mosely might be willing to get her started riding bulls. Mosely, a black man who had been in the sport for 24 years at that time, understood what it was like to participate in a sport dominated by white men. He was willing to teach her as long as she didn’t “waste his time.” When she showed up at his barn for her first lesson, he pointed to a barrel suspended more than eight feet above the ground from garage door springs, which he had named “Devils Delight” and told her to climb on. Ropes hung from the ends of the barrel for Mosely to pull the contraption like a sea saw, replicating the experience of riding a bull. Even though she was afraid of heights, Polly climbed on the barrel and began her new career. Impressed that she didn’t fall off Mosely agreed to coach her. After several months of riding Devil’s Delight for up to 5 minutes during her three hour training sessions five days a week and riding some real bulls too, Mosely convinced Polly to sign up to compete in the International Professional Rodeo Association (IPRA). There was no rule prohibiting women to compete against men in bull riding and Polly was allowed to throw her hat in the ring, so to speak, with the men and the bulls. He first pro rodeo appearance was on February 17, 1994 in Johnson City, Tennessee. She made it three seconds and was kicked in the jaw. Undaunted, Polly signed up for up to three rodeos a week. She wasn’t winning competitions, but she was generating media buzz and filling seats at rodeos. This turned out to be a blessing and a curse. Polly’s courage and tenacity attracted the attention of sponsors and news outlets. The money allowed her to travel from rodeo to rodeo with her daughter, which is one of her favorite memories from this period of her life, which she describes as being on permanent vacation. 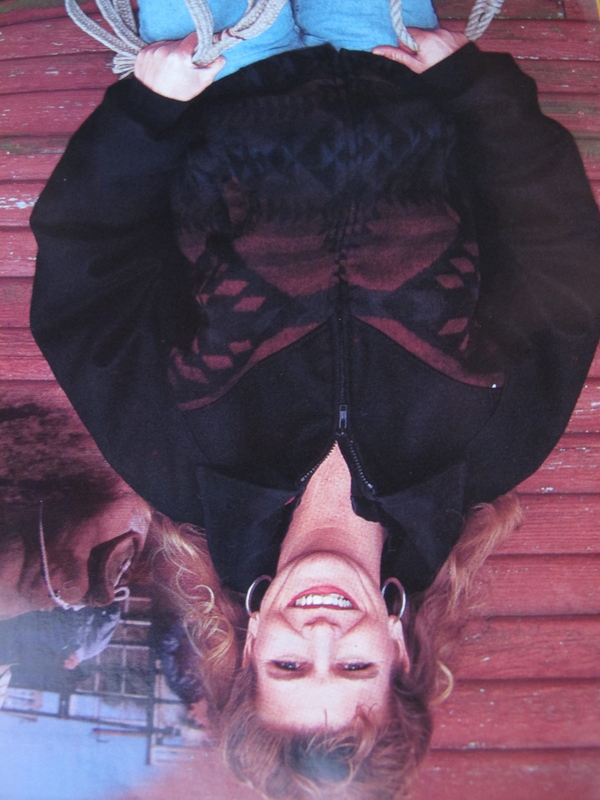 One of her sponsors, David James Fashions, sent her to a bull riding school conducted by rodeo legend Lyle Sankey who became an important mentor to Polly. Not everyone was excited about Polly competing as an equal with men. Some of her competitors on the IPRA circuit tried to intimidate her in very upsetting ways. While she competed on the IPRA circuit her dog, Sproket, was poisoned and died, the hood of her truck was deliberately unhinged-so it blew off of her truck while she was driving down the highway, and she was physically beaten by a group of unidentified men who ambushed her at night. If Polly was tough enough to ride bulls, she was also determined not to be “bullied” out of bull riding by her competitors. Her new teacher Lyle Sankey convinced her to leave the IPRA and ride in the more prestigious Professional Bull Riding Association (PBR) circuit instead. Fortunately for Polly the bull riders in the PBR behaved like gentlemen toward her and became some of her dearest friends. When Polly looks back on this time in her life she seems to mark time by her injuries, some of them literally life threatening. Almost every major competition or bull riding school memory is accompanied by a story about an injury that either she or another bull rider incurred. One of the most serious injuries happened at a rodeo on her daughter’s 13th birthday. Polly made the 8 second ride (or “covered” the bull in rodeo lingo) but lost focus on the dismount. Instead of looking over her shoulder for a place to land, she looked down and the bull did a belly roll. Polly ended up under the bull and it stomped on her chest. Even with her vest on Polly broke five ribs, two of them in three places, and punctured a lung. In the ambulance, on the way to the hospital, her heart stopped and she had to be resuscitated with defibrillators. At another competition, she had her scalp, ripped from her scull, and needed sixty stitches to reattach it. 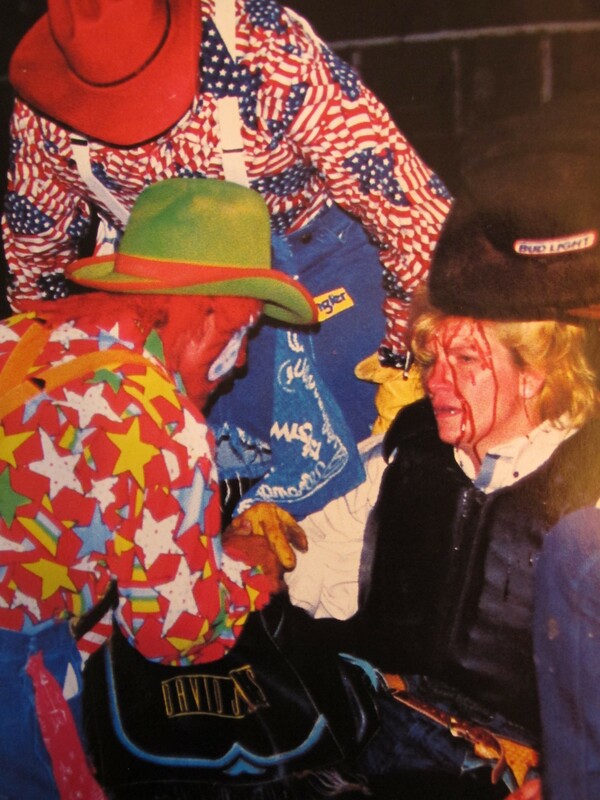 After Polly sustained this head injury she started wearing a custom made rodeo helmet and mask. 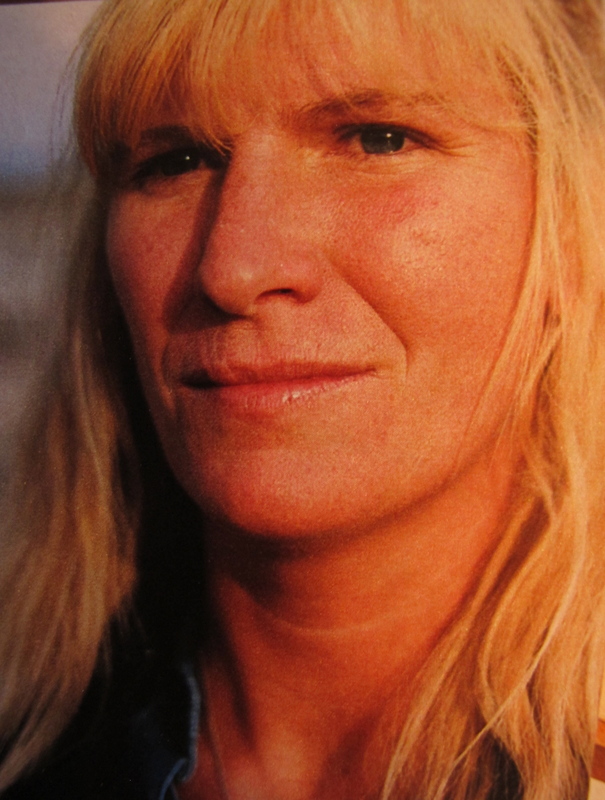 One article from a 1995 Western Style magazine lists several broken ankles, a broken wrist, broken pelvic bone, dislocated shoulder, and cracked tibia as the fractures her body endured. She also wracked up bruises, sprains, and infections. None of this dampened Polly’s spirit for bull riding and she often rode with a broken bone or hematoma that she kept secret from everyone, including her mentor, Lyle. To make Polly sound even more superhuman, she has an aversion to both hospitals and painkillers. When I asked Polly what her family thought when she told them she was riding bulls, she laughed remembering what her mother said, “Them cowboys are a no good bunch of gypsies.” “But she wasn’t worried about your physical safety?” I asked. “I guess I was such a daredevil as a kid, it didn’t surprise her,” Polly replied. The person who worried about Polly the most during this time was Polly’s daughter Ryen who was her constant sidekick and nurse. When Polly first brought Ryen to Mosely’s bull riding school to tell her about her new “hobby” Ryen started crying, understandably worried about the possibility of her mother being seriously injured or killed. But Ryen stuck by her mother throughout her career bull riding, helping Polly stretch before competitions and praying with her before every ride. Ryen learned to ride horses at competitions and was given a horse by a woman in Missouri. Ironically Polly is terrified of horses, but Ryen loves them. I asked Polly why she decided to compete against men instead of riding in the women’s bull riding circuit. (Yes, there are more women bull riders out there. Many compete in the Women’s Pro Rodeo Circuit) She said she didn’t really consider it. According to Polly she didn’t like the way women were treated on that circuit and they were not riding the best bulls, often they ride steers. Until this year, Polly was the only women that competed against men on the Professional Bull Riding circuit. In January, 21 year old, Kaylynn Pellam, competed in a Touring Pro Division event at an event held in Grand Rapids, Michigan. 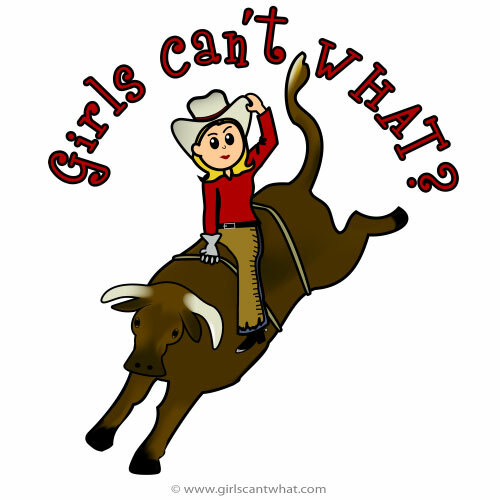 It has been fascinating for me to learn that there exists an entire subculture of women bull riders, and during research for this blog I also discovered that It that women may have been riding bulls in some fashion since Ancient Greek times. This Ancient Minoan fresco depicts men and women “bull dancing” a precursor to modern bull riding. 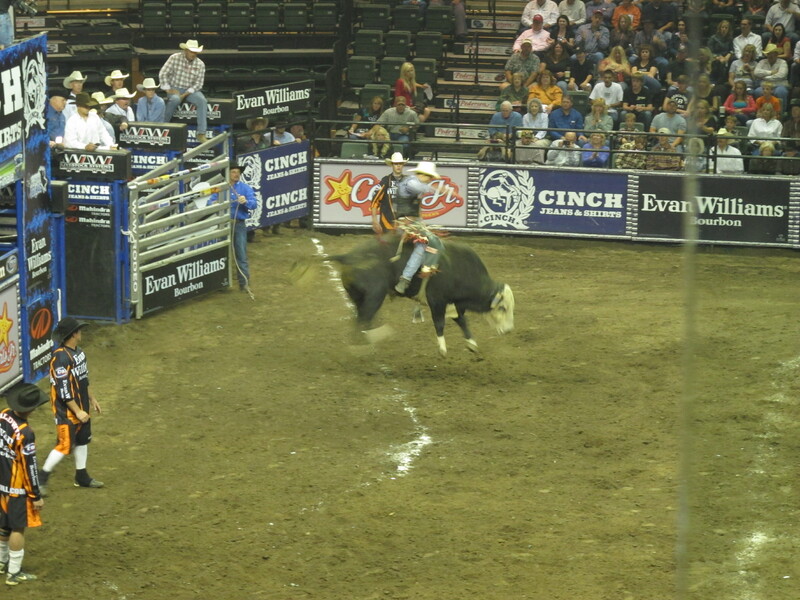 A fictional account of this sport is described in the novel “The King Must Die” by Mary Renault. Polly’s career ended in an abrupt and unexpected way. She was in Fort Collins, Colorado, riding her bicycle to warm up for a bull riding comopetition. As she cycled by the football stadium she was hit head on by a motorcycle policeman who was chasing a truck full of college students drinking out of a keg of beer in the truck bed. (There was a football game that day). He was driving the wrong direction in the bike lane with his attention was directed toward the truck and never even saw her coming. Polly’s shoulder was severely dislocated from her body because of the accident. Her career ended so suddenly and silently that there was a rumor circulating on the bull riding circuit that Polly had died. I can tell you that Polly is alive and well today. She has the energy of ten people and a big heart toward humans and animals alike. 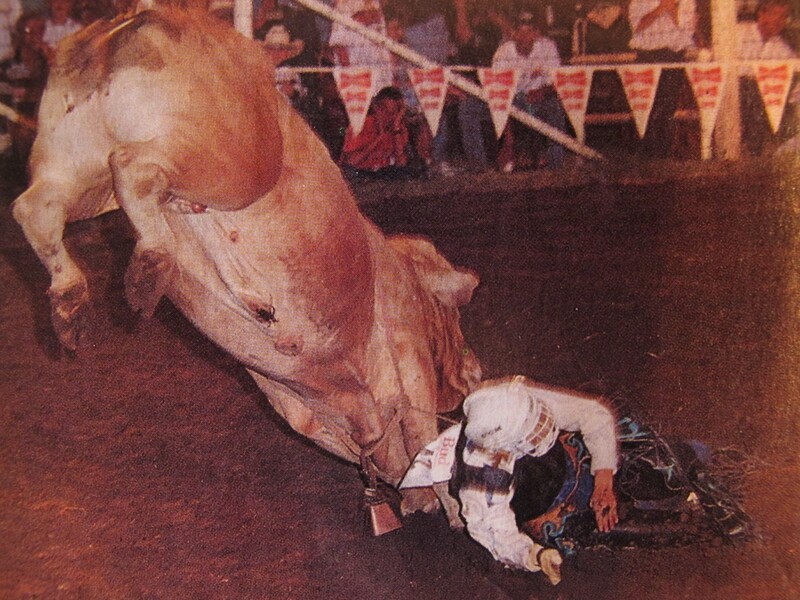 It can be difficult to understand why anyone would want to ride bulls. Polly told me that bull riding creates an unsurpassed adrenaline rush, but I think that bull riding may have been an outlet for Polly’s boundless energy and determination. Today she works five part-time jobs, four of them her own businesses including an elder care business and a dog boarding business, and she shows no sign of slowing down. “I have thought about what it would be like to get back on a bull,” she says. 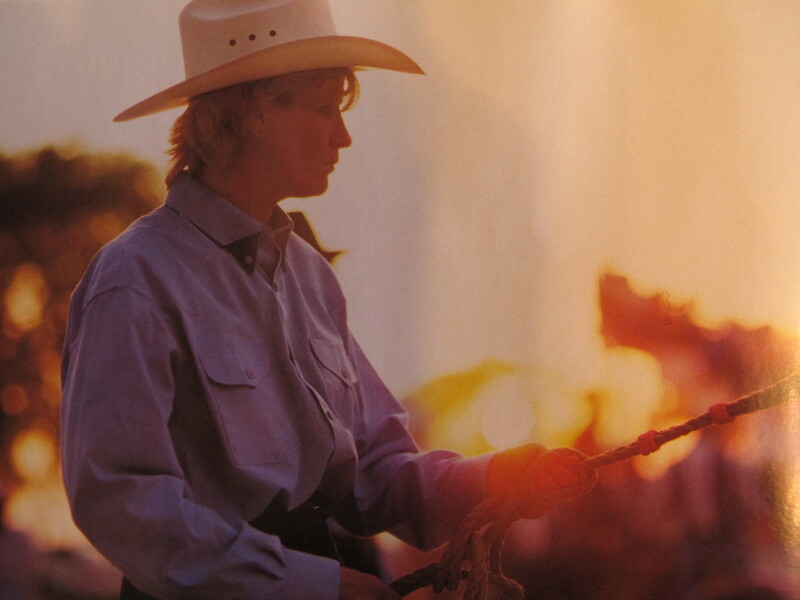 Even though her right arm is too damaged to hold the rope, she’s ambidextrous and she’s considered riding left handed. I don’t think it is only the bull riding that Polly misses, but the company of all the characters she met on the bull riding circuit. When I asked her if there was a defining feature amongst bull riders she told me that they are almost all universally cocky but also very funny. “Obviously if they are riding bulls, they don’t take much seriously.” It’s nice to see her spirit remains unbroken, but personally I kind of hope that Polly has hung up her chaps and her bull rope for good. There’s nothing left for her to prove. Special thanks to Polly Reich and for Gretchen at www.girlscantwhat.com for letting me use her graphic. This entry was posted in United States and tagged Bull Riding, Cattle, Female Bull Riders, NPRA, Polly Reich, Pro Rodeo Association. Bookmark the permalink. Love this story! Can someone please call one of their contacts and get a movie deal going, somewhere, for Polly’s courage was grace under pressure. Polly, you’re amazing. Hey there, my name is Shelby cox and I’ve been passionately interested in bull riding since i was 11, after i rode my first steer in a practice pen when i was ten. I live in north Texas and if anyone has any info. Or any type of comments to help me get started. Its my dream and i plan to get into motion while im still young. Thanks! I am always happy to answer any questions that you may have regarding bull riding! You go girl!!!! You can contact me at 970-690-9235 or at wowboltmarketing@gmail.com. The ONLY person that I recommend for teaching and coaching is Lyle Sankey in Branson Missouri. You can find him on face book or just google him and you will find him. Please feel free to contact me anytime, I really mean that!!!! I am also on face book Polly Reich in Fort Collins CO. Best of luck with your adventure!!!! Follow your dreams!!! I am so impressed with your determination and will power to do in life what you had the passion to do. my finace has created a piece of equipment that will help the bull riders and bull fighters from getting so many head injuries, I would love to show you a quick video of it. My name is Tunder Davis and I’m currently going to Full Sail University for my Master’s in Creative Writing and I’d love to write my screenplay based on your story. I was impressed from beginning to end and it gave me a lot of insight on where I should go with my story, but your story seems even better because you actually lived it. Despite your situations I think that you are truly an amazing person and I admire your courage and strength. 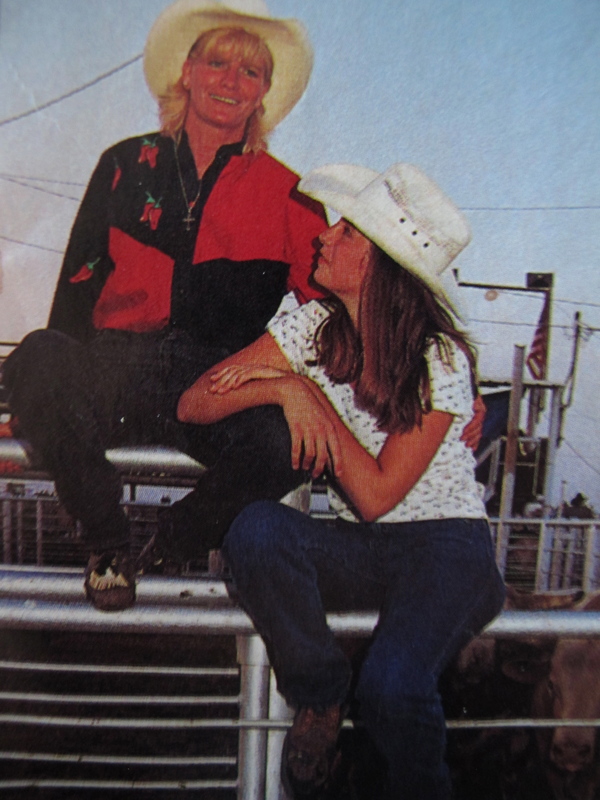 Altho recently Maggie Parker’s article in the Billings Gazette told of her serious injury riding at Cody Night Rodeo, she is NOT the first female bull rider. Billings, Montana resident Johnny Jonckowski was before her- and Polly Reichs also rode. If you check out the Cowgirls Hall of Fame you can read about several famous cowgirls that rode broncs and bulls way back in time.